Following our successful engagement with Keystone Automation on a logo design, BlackOut helped Keystone Automation staff extend the impact of their recharged brand with new business cards. Your business card leaves a lasting impression with clients and potential customers. 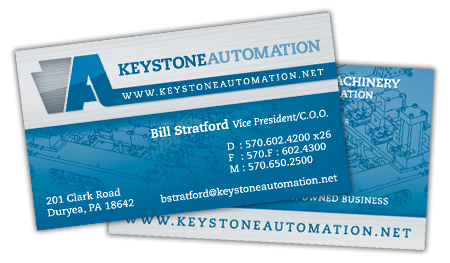 The staff of Keystone Automation can now feel confident that, each time they hand one out, their cards will communicate the professional reputation that the company has built over more than a decade in the industry.